The northern mockingbird is the only mockingbird that is found in North America, though the species has been known since the mid 1700s. The northern mockingbird is closely related to two other species that are found south of the United States and these are the tropical mockingbird and the Socorro mockingbird. 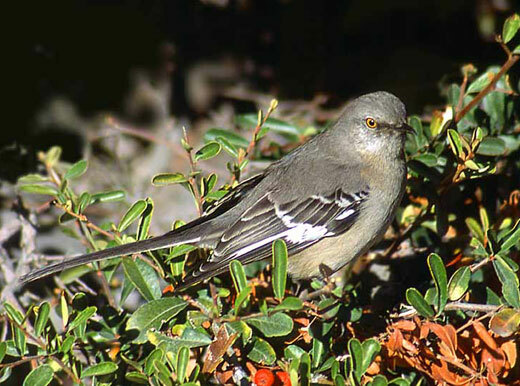 Though not common, it is known that there have been limited numbers of mockingbirds in Europe as well. The northern mockingbird is found in many places including southeastern Canada, northern Mexico, the Bahamas, the Cayman Islands, the Greater Antilles, and the United States. The birds generally do not migrate to and from other places, meaning they are permanent members of the areas that they are seen in. The birds usually build nests in trees or very dense shrubs. Their nests are made out of mostly twigs but they have also been seen using grass, scraps of paper, and bird feathers. Anyone or anything that nears the nest will know it because the mockingbird is a very fierce defender of its nest and the area that it considers its own. The northern mockingbird will actually let out a call to other birds and others will come and help to attack the invader. Mockingbirds will generally be found at great heights as they like to be at the top of maple, sweet gum, and sycamore trees. In addition they can be seen sitting on street lights, on top of buildings, and even sitting atop of telephone poles! If nothing else, they will often be sighted at the upper most branches of trees. The northern mockingbird is generally a ground feeder, meaning it looks for food sources on the ground by sifting through the vegetation. The birds will hunt from the sky and then swoop down, but often they are seen just picking through grasses and leaves. 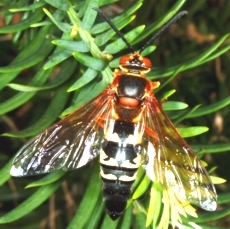 The species usually eats berries, seeds, and insects. Generally it seems that the birds will eat whatever is easily accessible and their willingness to eat a wide variety of things makes it easy for them to feed. 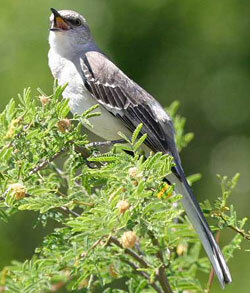 The northern mockingbird is known for its singing. The birds usually sing more during the morning and evening hours and the males will sing more often and more loudly than the females. It’s known that males sing as many as 200 songs. The birds are very loud and they often irritate other birds by mimicking the calls of other species. The birds are often irritating to humans because they are willing to build nests very near homes and will actually attack humans when they are nesting. They are also known for being natural alarm clocks, beginning to sing before the sun has even started to light the sky! Because of how obvious they make themselves, if you live in the right area of the world you will not have to actually spend much time looking for these birds, they will make themselves known to you, perhaps when you least expect it! Hi I am Reseraching The Northern Mockingbird For a class Project and im very impressed with what I see on Here!